Offering you a complete choice of products which include fluconazole 150 mg tablet, itraconazole capsules 100mg and caspofungin acetate injection 50 mg. DESCRIPTION:LIVCAN-150 (fluconazole), the first of a new subclass of synthetic triazole antifungal agents, is available as tablets for oral administration, as a powder for oral suspension.Fluconazole is designated chemically as 2,4-difluoro-α,α1-bis(1H-1,2,4-triazol-1-ylmethyl) benzyl alcohol with an empirical formula of C13H12F2N6O and molecular weight of 306.3. Fluconazole is a white crystalline solid which is slightly soluble in water and saline. LIVCAN-150 Tablets contain 50, 100, 150, or 200 mg of fluconazole and the following inactive ingredients: microcrystalline cellulose, dibasic calcium phosphate anhydrous, povidone, croscarmellose sodium, FD&C Red No. 40 aluminum lake dye, and magnesium stearate. Packaging Details: 1 Tablet in a printed carton. Itraconazole capsules are used to treat fungal infections in the lungs that can spread throughout the body. Itraconazole capsules are also used to treat fungal infections of the fingernails. Itraconazole tablets and capsules are used to treat fungal infections of the toenails. 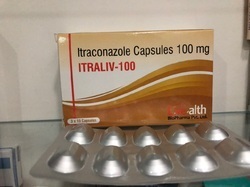 Itraconazole oral solution (liquid) is used to treat yeast infections of the mouth and throat or of the esophagus (tube that connects the throat to the stomach). Itraconazole is in a class of antifungals called triazoles. It works by slowing the growth of fungi that cause infection. Empirical therapy for presumed fungal infections in febrile, neutropenic patients. Treatment of Candidemia and the following Candida infections: intra-abdominal abscesses, peritonitis and pleural space infections. 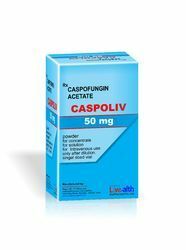 Caspofungin Acetate Inj has not been studied in endocarditis, osteomyelitis, and meningitis due to Candida. Treatment of Invasive Aspergillosis in patients who are refractory to or intolerant of other therapies (i.e., amphotericin B, lipid formulations of amphotericin B, and/or itraconazole).